Objective: To evaluate optimal pulmonary artery banding (PAB) for Fontan candidates, especially low-birth-weight infants. Methods: Thirty-one Fontan candidates who underwent PAB were divided into 2 groups according to body weight at surgery. One group (Group N) included 24 patients whose weight was ≧ฺ 3 kg. Another group (Group L) included 7 patients whose weight was < 3 kg. 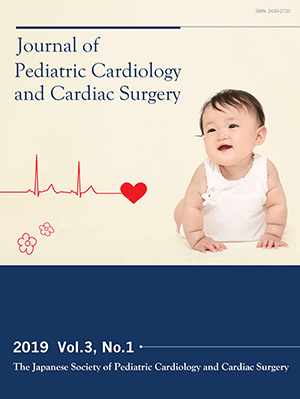 PAB was performed using ePTFE tape with a length of about 85% of the normal pulmonary valve circumference (n-PVC), in principle, but expandable PAB by 3-5 mm tighter fixation using absorbable suture was performed in 4 infants of Group L.
Results: Mean PAB tape length was 23 mm (85% of n-PVC) in Group N and 19 mm (82%) in Group L, and no difference was observed in the mean pulmonary artery pressure or SpO2 immediately after PAB. Cyanosis was exacerbated after surgery in the infants of Group L who underwent expandable PAB, and the absorbable suture was cut by percutaneous balloon dilatation in 2, but the banding tape loosened spontaneously in 2. Appropriate banding effects were observed in both groups on postoperative catheterization. Conclusions: In Fontan candidates, PAB to 85% of the n-PVC may be suitable. In low-birth-weight infants, expandable PAB with further constriction to about 80% using the absorbable suture seemed to be effective.